I thought that Tidy Mom had stolen this picture from a stock photo site because it looks so professional and beautiful. 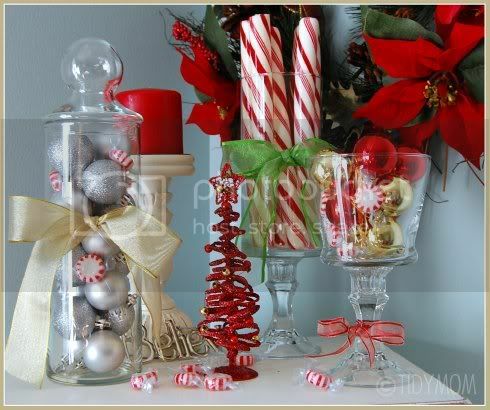 Can you believe she created this beautiful arrangement from items she found at the Dollar Store??? 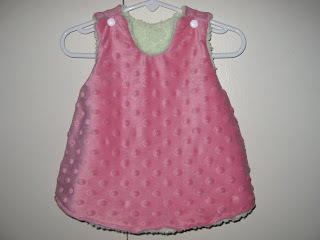 Sew Can Do made this adorable fleece jumper after seeing an expensive version at the store. She made her's for a lot less and improved the design making her version reversible. I am amazed that she has the time to sew with a newborn, but she has tons of cute projects on her blog. I am so glad that Fun to Craft linked up to my party last week, because I LOVE her project. She recovered her ironing board in cute fabric. My ugly ironing board hangs on the back of the door on display and could really use a makeover like this. Junk Blossoms found this great trunk at a yard sale for $2 and turned it into a coffee table. I love AngieB from Ballard Boys because she is always so practical. She bought Christmas fabric on clearance after Christmas last year and sewed bags to put her Christmas presents in. She even washed the bags in lavender-scented detergent. Who wouldn't want to get a gift in one of these? 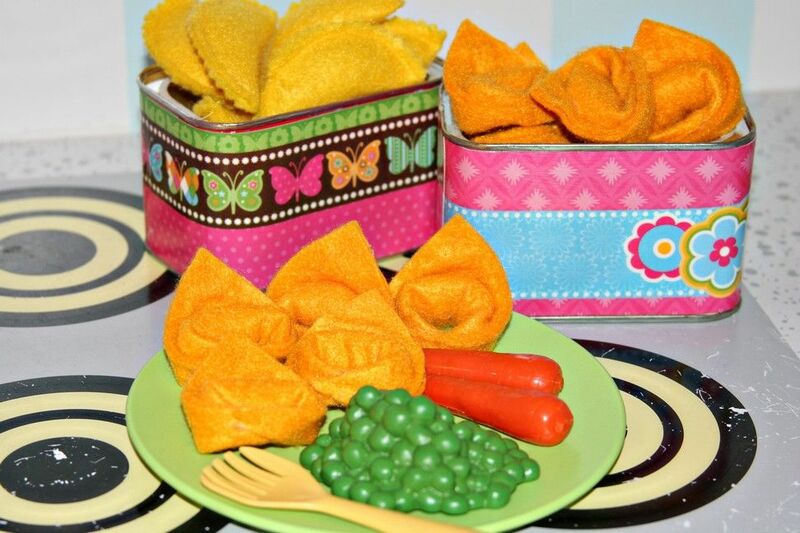 Treasures for Tots made this felt tortelloni pasta and tin. She used a maxwell house tin and spent 35 cents on felt. It looks like she spent a ton of money and they look good enough to eat. She has a great step by step tutorial on her blog. 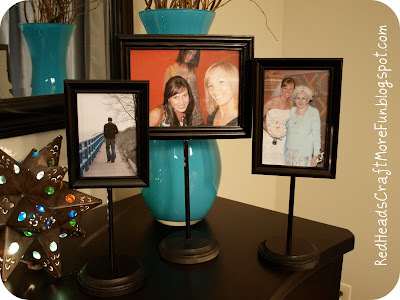 Check out these pedestal picture frames by RedHeads Craft More Fun. I cannot rave enough about these chore jars by Just Devine Style. She puts $10 in quarters in her kid's jars for the month. If they don't do a chore she takes a quarter out. I loved this idea so much that I had my kids make their own chore jars last night. So far they are working great. I have been trying to get my son to leave his sister alone and stop calling her names and saying mean things to her. Now when he does I will take a quarter out of his jar. Last night he even did the dishes! I really hope this works because I have tried everything else. One of my new favorite blogs is thrifty little blog by Kasey. She has some great ideas and I love her post about Finding Deals at the Dollar Store (Holiday Edition). She helps us navigate our way around the dollar store so that we can go home with great buys rather than big mistakes. I loved this post because I found it to be so true about dollar stores. You can really overspend on some items and score big on others. Thank you for highlighting my Felt Tortelloni Pasta and Tin tutorial! I've posted another penny-pinching felt tutorial for this week! LOL Thanks for the compliments on my picture!! and thanks for hosting such a GREAT party!! 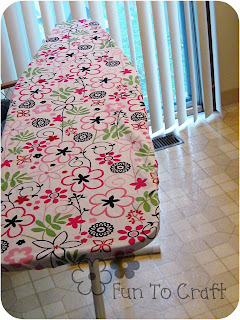 I almost bought my mom an cute ironing board cover, but I'm going to check out that link to make my own!! Thank you for showing my trunk coffee table! But most of all, thank you for hosting the link party. It is so much fun checking out all the great ideas. I wish many times I had more hours in a day so that I could visit more sites. I hope you have a great holiday season and a Merry Christmas. Pat @ junkblossoms! I'm seriously loving this party... and so happy that you're enjoying my blog! What a fun & interesting presentation. Tortillini are fabulous! Did you know someone is selling those ironing board cover on ebay for 29.00..I think. Great presentation. I love every details. Thanks for sharing it.